26.8 Cu. ft. Standard-Depth French Door 26.8 Cu. Ft., Adjustable Interior Storage, PureSource Ultra. II Water Filtration, Multi Level LED Lighting, Store-More Bins, and Effortless Glide Crisper Drawers. 26.8 Cu. ft. Standard-Depth French Door is rated 4.4 out of 5 by 58. Rated 5 out of 5 by Peter from We love this style refrigerator. We had one before... We love this style refrigerator. We had one before at our old home and bought another one when we moved recently. Our old one was stainless steel. This one is white. We liked/like them both. Very roomy and handy. 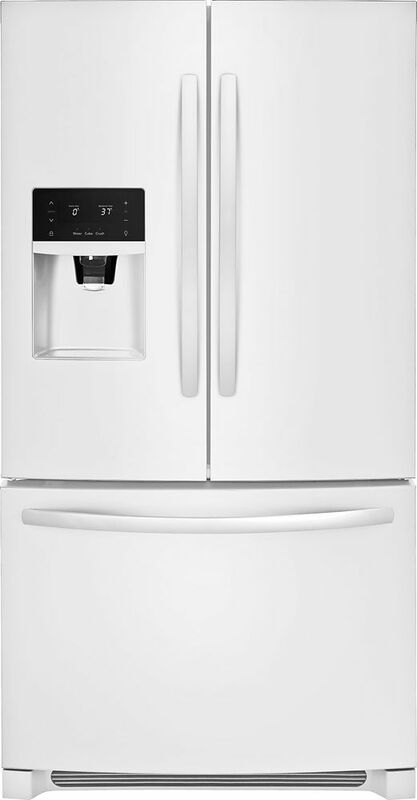 Rated 4 out of 5 by Jeff from Nice, modern looking appliance with a lot of usable space.... Nice, modern looking appliance with a lot of usable space. Adjustable shelves and baskets let you decide what is best for your needs. Well lit in both compartments. The digital display on the front gives a very high tech look. The only reason I didn't give it the highest rating is the ice maker. Not a lot of capacity and noisy when dispensing. All and all a good unit.